Scores Of Pastors Stand United at State Capitol in Defense of Marriage! With a statue of George Washington in the background, approximately 60 North Carolina pastors stood united on the south side of the State Capitol in Raleigh to defend marriage as God defines it! 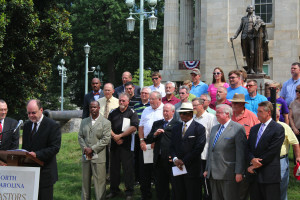 The occasion that drew these men together from across the entirety of the state was a press conference conducted by the North Carolina Pastors Network (NCPN). “As committed believers in Jesus Christ and His Holy Word, we believe that marriage is God’s institution. We also believe the Scriptures to be unequivocally clear that marriage is between one man and one woman. Because the 10th Amendment of our United States Constitution declares “The powers not delegated to the United States by the Constitution, nor prohibited by it to the States, are reserved to the States respectively, or to the people,” we reject the continuing, arrogant decisions of federal courts that assume the right to supersede the constitutional rights of states by negating said states laws and amendments, legally passed, that limit marriage to one man and one woman! Knowing that the 4th Circuit Court will soon render a decision on Virginia’s marriage amendment, and that the state of North Carolina falls under the 4th Circuit’s jurisdiction, we do hereby make the following demand! The press conference was covered by at least 10 media outlets including the Associated Press, FOX, ABC and others. What will be the outcome of the highly successful event is yet unknown. What is know it that NC Governor Pat McCrory now knows how the pastors of North Carolina feel about the hard fought victory of marriage in 2012! 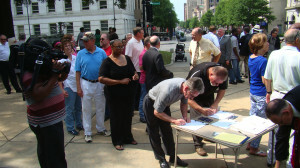 Additionally, it should be abundantly clear to the Governor that the majority of North Carolina citizens want their Marriage Amendment defended, should the 4th Circuit Court of Appeals overturn Virginia’s Marriage Amendment, hence affecting the NC Amendment (since North Carolina is under the 4th Circuit’s jurisdiction). Why won’t you allow people who love each other to marry? Why do you carry such cruelly in your heart? There was a man who live in Israel 200 years ago, a son or a carpenter, who made it a point to hang out with the outcasts of society? Be careful who you cast out – because that will be the person who is eating at the table with Jesus.